A very good rendition of the classic Zeffirelli production of the iconic opera, with a particularly eloquent Rodolfo. Set in the Bohemian Paris of the late nineteenth century, Rodolfo, a poet, comes together with Mimi, an embroiderer. Mimi has consumption, but they engage passionately nonetheless. But Rodolfo is a jealous type and they fall out long enough to create the drama, and come back together just before Mimi dies. Marcello, Rodolfo’s friend and a painter, is in love with Musetta, a frolicsome type who really loves him but pursues a richer alliance. She, nevertheless, has a heart of gold and helps Mimi in her final stages. 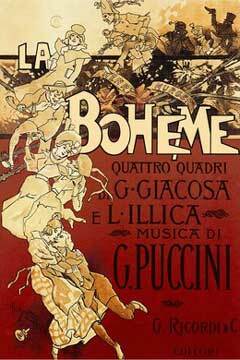 There’s not much to the plot, but that doesn’t prevent the music from soaring in this Puccini classic. One notable theme follows the next and one waits with bated breath for each succeeding great aria. This production is blessed with a very strong Rodolfo in Michael Fabiano, whose voice is silky and lean, whose phrasing is delightful, and whose acting is far more than competent. He’s a great tenor and brings a wonderful tenacity and grace to this leading role. As his sidekick, Marcello, Lucas Meachem, is, as well, grand and eloquent, singing with a distinctive richness and carrying off his thespian duties with a kind of gleeful ambiance that makes the lives of these old hipsters seem immediate and believable. As Musetta, the lively coquette who keeps Marcello on his toes, Susanna Phillips does a delightful job, singing her glorious break through the roof aria with an inventive simplicity that is charming and captivating. As Mimi, Sonya Yoncheva comes entirely into her own in the third and fourth acts, her supple and rich soprano filing out the registers of her pain with grandeur and sonority. Earlier on, Yoncheva is a bit stiff; her voice, though rich, doesn’t quite resound as it does later on. Though, as an actress, Yoncheva makes Mimi’s final moments believable, the power of her voice rather than her thespian abilities come through as her great strength. This Zeffirelli production shines most vividly in the second act in which an entire town is wheeled onto the stage in a two-tiered affair. It’s dramatic, it’s overpopulated in an entrancing way, and it makes a great backdrop for the scene below in which Musetta holds forth effusively and energetically and Mimi accompanies her resoundingly. It’s clearly a production of the old school, of the sort the Met is gradually replacing, but one that continues to have many of its old world charms intact.